The American School in Switzerland kicked off the 2016 edition of International Week on the morning of February 29 with the Parade of Flags, a popular annual tradition. The entire opening assembly, which also included a presentation of the School’s prestigious Torch Awards and an excellent musical performance, can be viewed by clicking on the video clip above. With the whole School gathered in the Palestra, Headmaster Lyle Rigg opened the ceremony by noting how pleased Founder M. Crist Fleming would be to see just how international TASIS has become. He then ceded the podium to Eddy Sella ’16 and Sky Rourke ’20, who took turns announcing the flag bearers for each of the 64 nations currently represented at TASIS. The assembly concluded with an outstanding Performing Arts presentation that featured musicians and vocalists from all three divisions, Middle School dancers, and the TASIS Cheerleading team. Click here to see many compelling images from the assembly. In the annual High School World Cup Tournament, Azerbaijan-Turkey bested Vatican City in a penalty shootout following a scoreless regular session to capture the championship trophy in front of an extremely raucous crowd in the Palestra. The A-T team had bested a powerful Russia squad in another penalty shootout in the semifinals while Vatican City had knocked off Italy 1-0 to reach the final. Other competing teams were Italy Jr., Mexico, FC International (a mixture of Italians, Turks, and Scandinavians), MILK (predominantly Montenegro, Italy, Lithuania, and Kosovo), and NATO (Belgium, Canada, Japan, Italy, Russia, and US). Prior to the World Cup final, Brazil defeated Italy-Turkey 1-0 in the girls exhibition game. Gabriele Capacci ’17 of Vatican City was named tournament MVP while Russia’s Roman Sokolov ’16 earned the Golden Boot award as the top scorer, finding the back of the net nine times in five games. All of the World Cup entry fees (totaling CHF 720) were donated to the Mission Morocco Service Learning Group, which Azerbaijan-Turkey represented. Click here to see some excellent photos from the tournament. 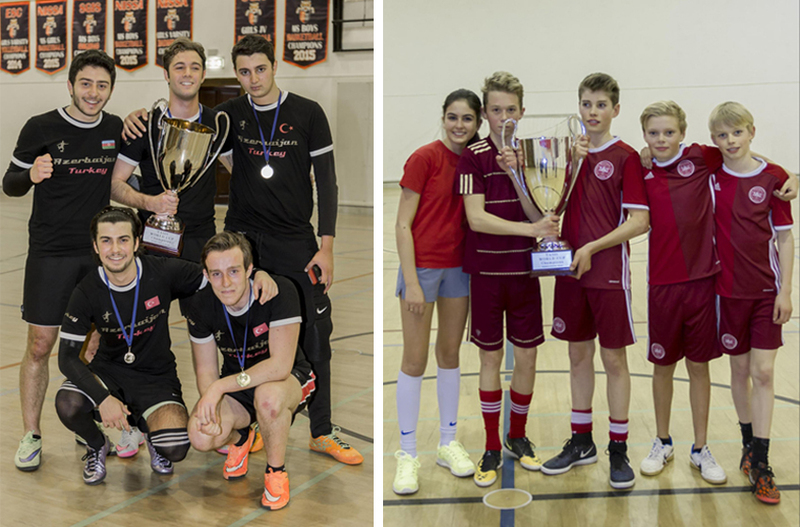 The Middle School World Cup was also a resounding success, with six teams battling for the 5th annual championship. South America-Italia led the way with two impeccable performances in round-robin play, setting up a final with The Northern Countries. Excellent defensive play from both squads and solid goalkeeping from Matias Riis ’22 and Tancredi Lo Monaco ’20 sent the final game into a penalty shootout. In the end, Giulia Meregalli ’20 kept her composure and delivered the game-clinching goal for The Northern Countries, who represented Poverty Awareness and helped raise a total of CHF 280 CHF for Saùde Criança (Children's Health) in Brazil. Click here to see lots of great photos from the tournament. One of the best parts of every International Week is the food. 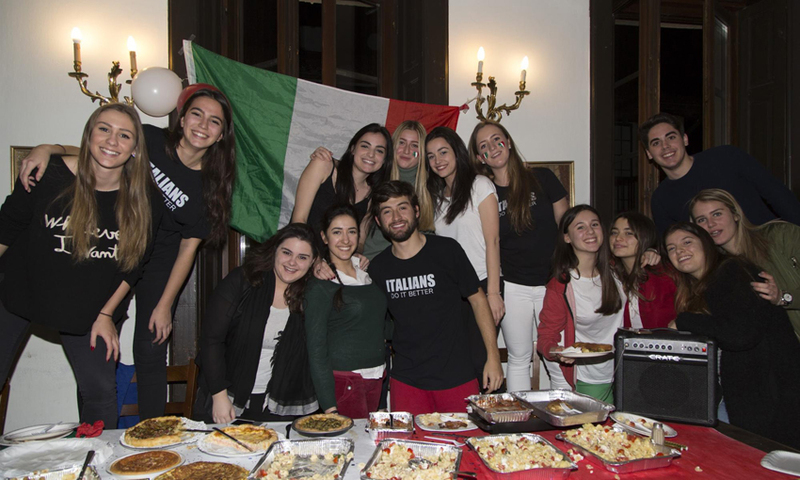 Between the High School International Food Fair, the Middle School International Breakfast, the Elementary School Potluck Dinner, and the internationally-themed lunches and dinners served in De Nobili throughout the week, everyone on campus has the opportunity to try delicious cuisine from all over the world. Click here to see some highlights of the week. 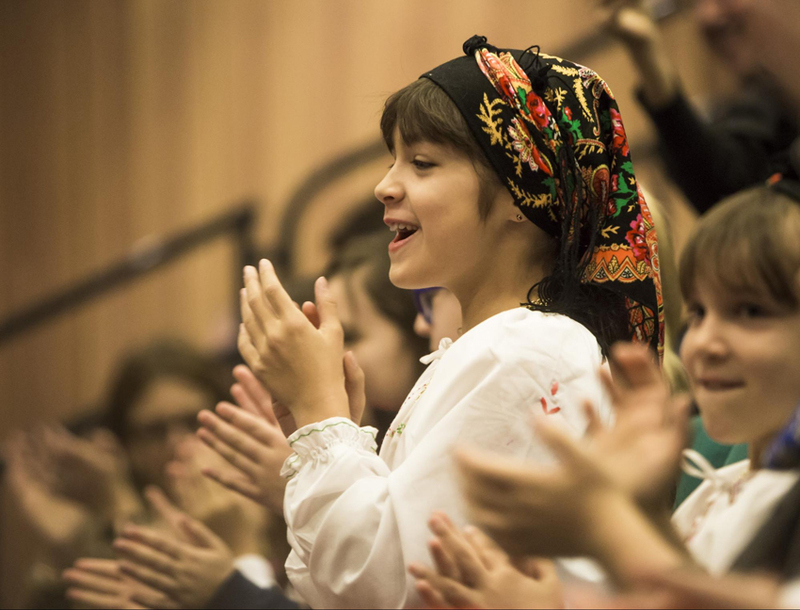 Students also appreciated the opportunity to escape their school uniforms throughout the week by participating in themed dress-up days: Traditional Costume Day on Monday, Swiss Day on Tuesday, Jersey Day on Wednesday, Flag Colors Day on Thursday, and Wear A Friend’s Traditional Costume Day on Friday. The High School closing assembly capped off a great week with a presentation of World Cup Awards by Athletic Director Sonny Kim, an inspiring slideshow of School Photographer Kim Nelson’s best images from the week, and a beautiful medley of songs from around the world performed by members of the High School Choir, who sang each song in its original language.